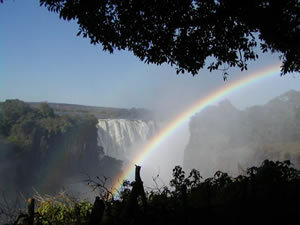 A very easy border crossing - $55 each for a Zimbabwe visa then $25 for Carbon Tax and Temporary Import Permit for Mitzi and we were on our way to the famous Victoria Falls; the very friendly Immigration Officer even gave us a $1 million, old Zimbabwe note as a souvenir! One friendly police check 200 mtrs down the road to see driving licence and car permit then a good tar road to the Victoria Falls Municipal Camp Site, which turned out to be really good . A highly recommendable set-up with campsite and a range of lodges and cottages. For $50 a night between the 4 of us, we settled on a 2 bed-roomed cottage with self catering facilites and a very good on-site restaurant called "In-da-Belly". After settling in and sampling a very tasty lunch and local beer at the restaurant, we set off on foot for the Falls. Within 20 mins we were gazing with awe at the spectacular, rainbow arched waterfall and another lifetime ambition was achieved! The rivers feeding the Falls are so high at this time of year that the amount of water going over the falls was incredible. 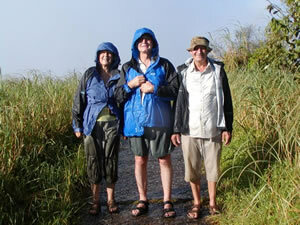 The spray was drenching even wearing waterproofs and photography was difficult. It was evident by the few tourists that were visiting the Falls that Zimbabwe's tourist industry has suffered greatly over the past years but most locals we spoke to were feeling more positive about the improving situation. Food is finding its way on to supermarket shelves (from South Africa) and currency is now $US and SA rand. Everyone we met, police and locals alike were extremely friendly and there was an air of optimism throughout all sections of the population. The roads are generally good and fuel is readily available without being too expensive - $1 per litre -cheaper than UK! After Vic Falls we headed south to Hwange National Park stopping for a lunchtime drink at The Baobab Hill-top hotel overlooking the coal mining and electricity generating town of Hwange. Again we took a $50 cottage at Main Camp and spent a couple of days game viewing. We are still searching for the elusive big cats but saw a beautiful family of rare Serval cats with 3 cubs on an early morning drive. South to Bulawayo . 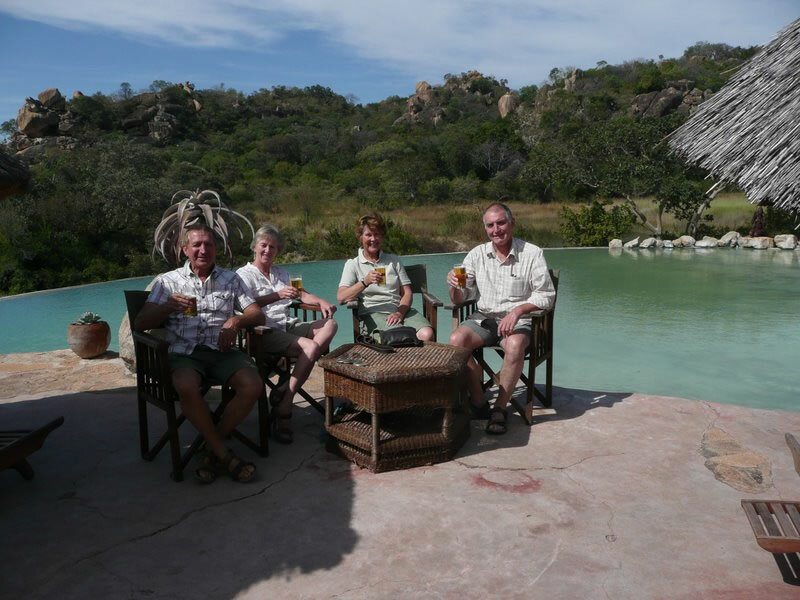 After trying to book accommodataion through the Zimbabwe Wildlife and Parks department - who weren't able to help us, we were directed by a local to the Musketeers Lodge on the outskirts of Bulawayo. Owned by Billy, and managed by Erica and "Granny Clampet" we took a couple of very nice 'tartan' furnished rooms aroung the edge of a lovely green and shady garden. 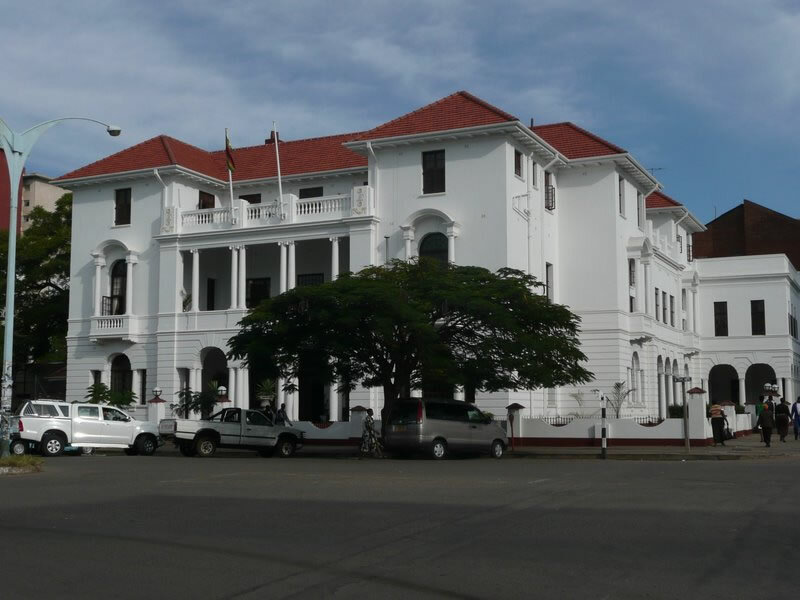 It took some time for us to find out that Bulawayo is twinned with Aberdeen, hence the tartan connection. Driving in we passed very English looking houses and bungalows, beautiful gardens and even a mock-tudor pub called The Churchill which looked as if it had been transported from a Cheshire village.That evening we decided to give its restaurant a try but were rather disappointed with the food although the service was very attentive. Maybe that was because there were only 6 people in the place; what was even more disappointing was watching Manchester United getting beaten by Barcelona in the European Cup Final. 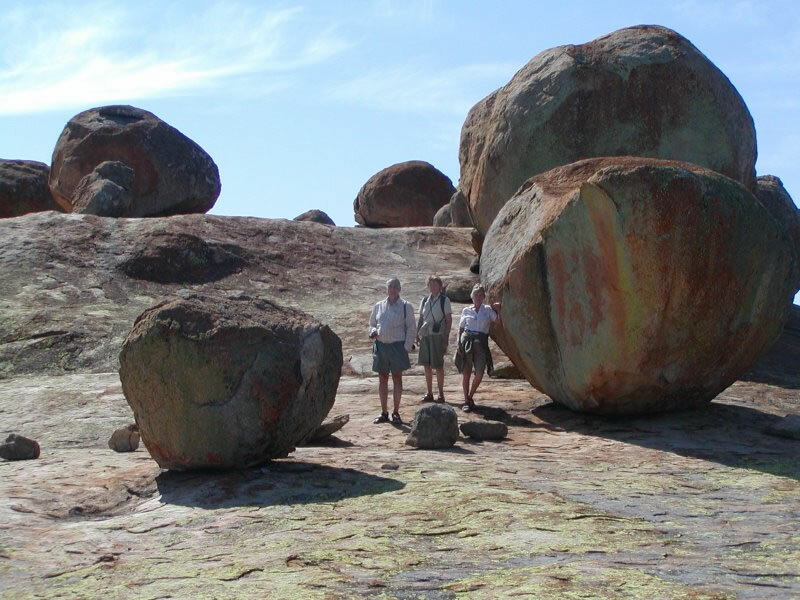 The following morning we headed off to the Matobo Hills and Matopas National Park to see the wonderful rock formations and visit Cecil John Rhodes' Grave. We also searched out a lodge called Camp Amalinda which had been recommended and were given a conducted tour round many of the quirky rooms hewn out of the rock and thatched so that they were completely disguised. A really great example of using natural materials to blend into the surrounding countryside. Back to Bulawayo for a pizza lunch then a wander round the town to get the flavour and atmosphere of the place. We were very impressed with Bulawayo; clean wide streets, all visibly named, with most traffic lights working. Few cars, so driving or walking was a pleasure and the buildings were in good repair. Many of the shops were empty or not open but there was evidence that some were re-stocking and due to open again very shortly. 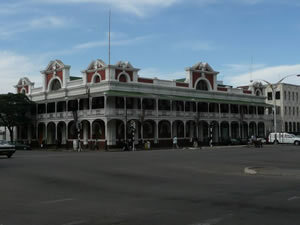 There were many beautiful old colonial buildings still in good repair and functioning. We had a conducted tour of the old Bulawayo Club, a colonial gentleman's club to which, in the past, ladies entered by the back door. 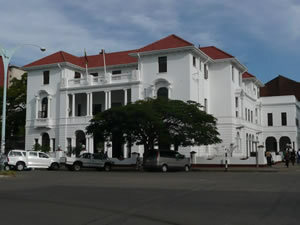 It was still functioning as such but having to adapt to modern Zimbabwe; undergoing re-furbishment of the upper two floors into a hotel but retaining the ground floor as a fairly exclusive club. The Bulawayo Library was stocked with books and a thriving Internet section and the National Gallery has a beautiful wrought iron verandah which wouldn't have looked out of place on Capetown's Long Street. We had a really great time and were made really welcome in Zimbabwe; we would recommend it.